Title page illustrations by Matthew Causey, design by Zoe Pappenheimer. I interviewed Rebecca Hutchinson, Jerry Bennett, and Rosette Gault because they are all early innovators in paper clay as an artistic medium, independently incorporated it in their studio practices, and are teachers who are willing to share their knowledge. I did the interviews between May and October 2018 as individual phone calls, then edited them for Studio Potter. 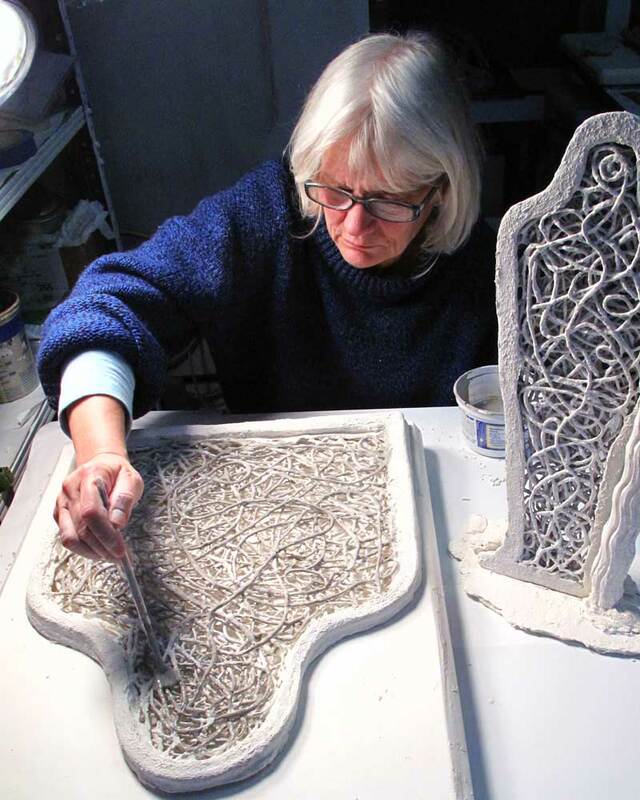 Lorie Nelson: What references, cultural or otherwise, led you to use paper clay in your work? Rosette Gault: My story begins when I was a student [at the University of Colorado Boulder] in 1971 studying with [Professor] Betty Woodman at the Firehouse Studio. I was learning the rudiments of clay and glaze chemistry, making and mixing clay bodies from raw materials, and the rationale behind the differences between a potter’s clay body recipe and a sculptor’s clay body recipe. Sculptors’ clay bodies at that time were using grog. So I started working with the grogged clay, and I wasn’t happy with it at all. I thought, There’s got to be a better clay body. And, Why can’t you work with it wet and dry? And, Why do I have to baby everything so much at every stage in the process? I yearned for expressive freedom most of all. But of course, during those years, everyone said, “Oh, there’s no other option to the traditional rules, unless you want to use nylon as a fiber in your clay. And don’t use paper pulp or anything like that, because it’ll just stink to high heaven, and then your clay can’t be aged.” They gave all kinds of reasons like these. As a full-time studio potter and teacher of pottery and sculpture after grad school, I chose to use a couple of traditional porcelain and china-clay bodies consistently for tableware, as well as a terra-cotta; and also some jet-black bodies once in a while, depending on the kiln or firing process. I did that up until 1990, when, on a residency, I decided, “Oh, I’m gonna scale up and see how big I can build.” There happened to be a papermaking studio next door, with a Hollander mixer-beater for making pulp. I ended up borrowing some pulp to mix into the clay body, and then I ended up mixing my own pulp. In retrospect, there was a synchronicity during the next few days of work, as my work habits with traditional clay proved to be almost useless and working wet to dry with paper clay provided the right balance.